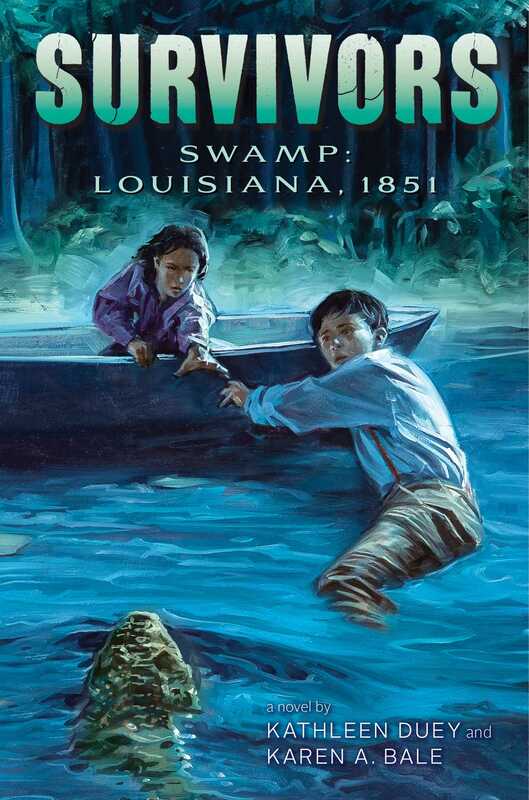 Two friends struggle to survive the treacherous journey across the snake- and alligator-infested Louisiana bayou in the seventh book in the Survivors series. No one in Lily LeGrand’s Cajun community is willing to help search for Paul Courville, who is missing in the bayou along with his mean-spirited older brothers, William and Mark. Why should they? Paul’s wealthy plantation-owner father has made no secret of his disdain for Cajuns. But Paul has always been kind to Lily, defending her against his brothers’ merciless taunts and humiliating pranks—and Lily refuses to turn her back on him when his life is in danger. On her own in the maze of the dangerous bayou, Lily knows she has more to fear than her father’s wrath. Her treacherous journey will test both her knowledge of the swamp and her courage. Can she find Paul before it’s too late? The harsh squawk of a crow made Lily LeGrand look up. The long, wooden dye-paddle in her hands came to a stop for a few seconds as she scanned the top of the levee. Where were Augustin and Pierre? If the crows got into the corn now, a week from harvest, Maman would be furious. Lily started nudging at the cloth again, moving the bolt of cottonade through the simmering liquid. The water reeked of salt and vinegar, the mordants Maman was using to set the dye this time. Staring down into the water, Lily noticed a fleck of onionskin that had somehow missed the strainer. She bent to pick up a twig and fished out the onionskin, then straightened her back and looked at the sky, wishing she could slip away and paddle her pirogue into the deep reaches of the swamp. It worried Maman when she went, but the truth was, Lily was more comfortable on the water than anywhere else. In her pirogue she was as fleet and graceful as anyone, young or old, man or woman. Lily sighed. It was going to be another hot morning. They had been having thunderstorms late in the afternoon, and the ground was steaming as the sun rose high enough to clear the line of towering cypress trees on the east side of the bayou. The sound of her mother’s voice made Lily turn quickly, and she lost her balance, her lame foot refusing to bear her weight. She braced herself against the dye-paddle and managed to avoid falling. Lily pushed the paddle deep into the water, winding the cloth around it, then lifted the dripping mass slowly, bracing the end of the paddle against her hip. “A little longer,” Maman said, and Lily lowered the cloth back into the steaming dye bath. “I heard crows,” Lily said. Lily nodded, feeling only a little ashamed that she had assumed her brothers were playing instead of working. Most often when she assumed this, she was right. Augustin was usually figuring out how to avoid work, and Pierre would just trail his older brother around. “Brulant!” Rose Eva said gravely, her little mouth in a straight, serious line. “Boiling hot!” Maman agreed. “And you could hurt yourself.” She kissed Rose Eva’s cheek and set her down again, keeping hold of her hand. Lily nodded but didn’t say anything. Every time she complained to her mother about something Augustin did, Maman would scold him, and that only seemed to make things worse. Lily started down the path toward the levee, walking as fast as she could. Placing her left foot carefully as she always did, she kept her crooked ankle from turning beneath her weight. She ran in an uneven rhythm that was hers alone. Going up the steep slant of the levee, Lily turned sideways, taking a big step with her strong leg, then hitching her left foot alongside. Once she was at the top, she stopped and stood still, turning in a slow circle. The pirogue was still there, and so was the little raft the boys had made earlier in the year. The bateau was gone, but that only meant her father was still out gathering moss. “What do you see?” Maman called. Lily gestured at her to wait a moment, then shaded her eyes, looking up the bayou. 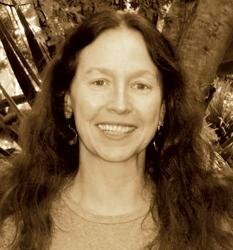 The sun was bright where she stood, but just a little farther south was a stand of live oak trees that cast dappled shadows over the dark water. Farther still, the tupelo gums and palmettos grew thickly along the banks. Every family had cleared enough ground to build a planked dock that jutted out over the warm, slow water. The bayou was empty as far as Lily could see. Looking north, there was no sign of her brothers, either. The sun shone on ’Nonc Jean’s gardens. His place—and those of the rest of the LeGrands—were better kept than almost anyone else’s: hardly a shred of palmettos or tupelos growing behind the levees. Their fields went farther back, too. Only at the far end of their long, narrow farms did they permit the natural growth of the swamp. Lily nodded. It was true. Augustin had become irresponsible lately. Lily started back toward the house. Lily nodded and went around the side of the house, knowing that if Rose Eva or Marie saw her, they would want to tag along. She would be glad when they were both old enough to help more. There were days when she and Maman were too tired to eat in the evenings. The pigs were in the indigo patch, and she chased them out, relatching the gate they had pushed open. Milk and rice hulls were still in their trough, so they went back into their own pen happily enough, squealing and snorting. Lily glanced at the cage à poulet. The tall, black rooster was crowing from a fence post, his hens scratching at the dark, moist soil beneath. There was no sign of Augustin or Pierre. Lily crossed the yard and walked around the back of the chicken coop. There were ashes piled six or seven inches deep, heaped into feathery mounds, all along the back wall. So the boys had finished that chore, at least. She could see the big red ants struggling to find their way through the suffocating powder. Straightening, her hands on her hips, Lily squinted to see through the shadows beneath the trees that marked the end of the yard and the beginning of the cornfield. She listened, hoping that her brothers had heard the crows too, and were out there, but she still couldn’t hear their voices. Sighing, Lily walked across the yard, glancing into the cowshed as she passed. Earlier that morning, she had hung the bucket, clean and dry, ready for the evening’s milking. The stall was still wet and full of manure. So the boys had not even started their regular chores yet. Lily made her way, careful not to twist her weak ankle where the ground was muddy. A little farther on, she scuffed her bare feet in the grass to clean them off, then tried to miss the worst places. Maman always hated it when Lily stained her hemlines, and now that Lily had begun helping with the weaving and sewing, she understood why. “Augustin!” Lily shouted as she started down the slope toward the first rice field. There was no answer. Lily walked a little farther, then called her brother’s name again. She was a half mile or more from the house, almost to the wild swamp, before she got an answer. Augustin and Pierre came running when they heard the impatience in her voice. They tumbled over each other in their eagerness to apologize. She knew they were sorry, but it was more than that. They didn’t want her to tell Maman that they had been playing. “That was Pierre’s job this morning,” Augustin defended himself. Pierre looked insulted. He pulled himself up to his full height, the very image of eight-year-old dignity. “That is a lie.” He looked so stricken, so insulted, that Lily could not help but laugh. Augustin joined her, his mouth twitching at the corners. Pierre allowed his expression to dissolve into a grin. “Just go, both of you!” Lily said. They shot her grateful looks, knowing now that they would not get into much trouble. Then they ran back toward the house. Lily followed their footprints, stopping to step over puddles they had leaped, skirting bushes they had burst through. By the time she ducked out of the shade of the live oaks and went back around to the front of the house, her father had arrived home. “Of course, Papa,” she called back. “Do I have to go?” Lily interrupted, her stomach tightening. “It will be faster with two of us to paddle,” he said. Lily started to plead, then pressed her lips together. Her father could not begin to understand why she hated going to the Courville plantation. Lily had never told him why, and she never intended to. It would only make him start a fight he could not win. She blinked back tears and swallowed hard, turning so Papa could not see her face. “I will wash up,” she said over her shoulder. Then she forced herself to start for the house.